Pastor Bryan Coelho came to know the Lord Jesus Christ in 1985, He was called by God to dedicate his life to Christ. He then, went on to pursue his Bachelors in Theology at the Maryland Bible College and Seminary in Baltimore, Maryland in 1989. When he graduated in the year 1992, he came back to India and served in Greater Grace Mumbai. 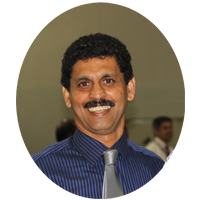 He later received the call to go to Bangalore where he is currently serving as the Senior Pastor of the Church. While in the U.S., he was mentored by Dr.Carl H.Stevens, the founding Pastor of the Greater Grace World Outreach, to whom he is deeply indebted and grateful for his investment, teaching, friendship and encouragement. The heritage he has received from his training stands as a Landmark in his ministry here in Bangalore.